Former brownfield sites offer opportunities for economic growth. How can industrial cities dealing with legacy of contained areas promote neighborhood-scale arts-oriented development? Can such sites benefit from policy integration? MCP Allegra Fonda-Bonardi did a yearlong study of the ARTFarm for Social Innovation in Somerville; Massachusetts to better understand how one city tried to find the right balance between environmental clean-up, real estate reinvestment and neighborhood control of the development process. She starts of with the premise that integrating city-wide environmental, social, and economic sustainability is possible, and that civic spaces that aim to meet multiple objectives are more likely to succeed than those that don’t. Allegra also discusses in her thesis the importance of demanding accountability from developers who offer to fund remediation, to ensure that a portion of the remediated land is used to meet neighborhood priorities. Did the ArtFarm create a precedent? You can find the answer to this question and more in Allegra’s thesis, here. How can we do a better job of promoting investment in green infrastructure? 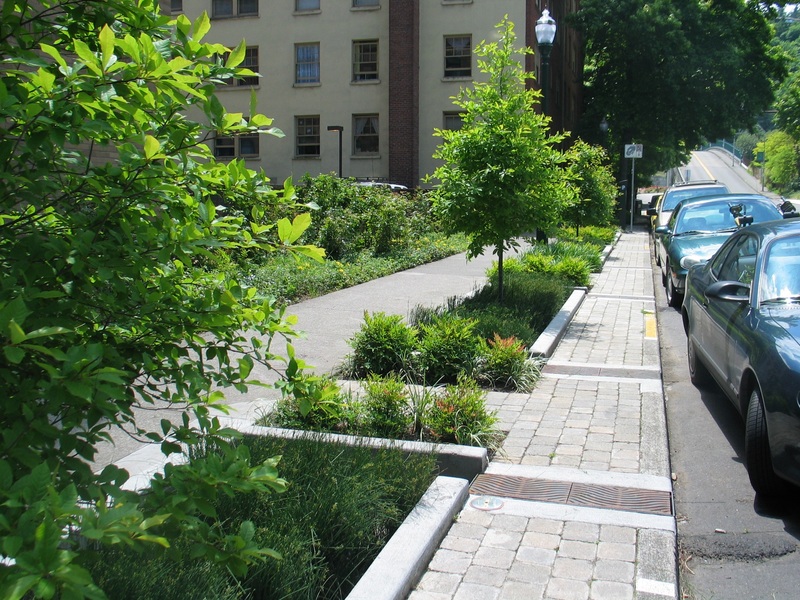 The planning community has increasingly recognized green infrastructure as the most effective approach for cities to manage the environmental impacts of stormwater runoff, a major sources of contamination to urban waterways. Despite this recognition, green infrastructure has not yet achieved the desired scale of implementation, in part, because implementation produces highly variable results. However, green infrastructure pilot studies, called ‘demonstration projects,’ have been conducted throughout the United States with encouraging results. In his thesis, Alex Marks (MCP ’15), uses the case of Boston to explore how demonstration projects can further green infrastructure implementation. Alex identifies four major objectives of case studies: (1) testing the physical performance of green infrastructure for wider use, (2) fostering interdepartmental learning to construct and maintain green infrastructure projects, (3) cultivating public awareness and support for green infrastructure, and (4) achieving regulatory compliance. If demonstration projects are designed to reflect these four objectives, they can reduce the hazards of stormwater runoff. Alex constructs a recommended demonstration project methodology to assist city planners in formulating green infrastructure initiatives. Green infrastructure can contribute to greater equity in the allocation of stormwater discharge permits. To read more, see Alex’s thesis, here.